While the Drake Well is often called the first commercial oil well, there are a few other wells that also hold this claim in Azerbaijan, Ontario, West Virginia, and Poland. The Drake Well is considered significant though, because previous oil wells were used for drilling for salt brine and the oil was more of an accidental byproduct. 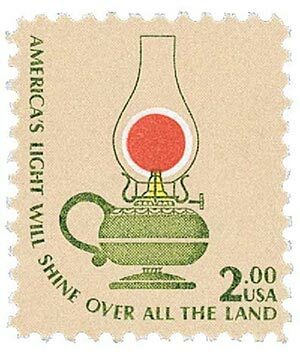 U.S. #1611 – Kerosene Lamp from the Americana series. For hundreds of years, the area around Oil Creek in Pennsylvania was known for its natural petroleum seeps. The Native Americans used it for centuries before Europeans arrived and used the “mineral oil” for medicinal purposes. By the late 1840s, the oil was being used to light lamps. 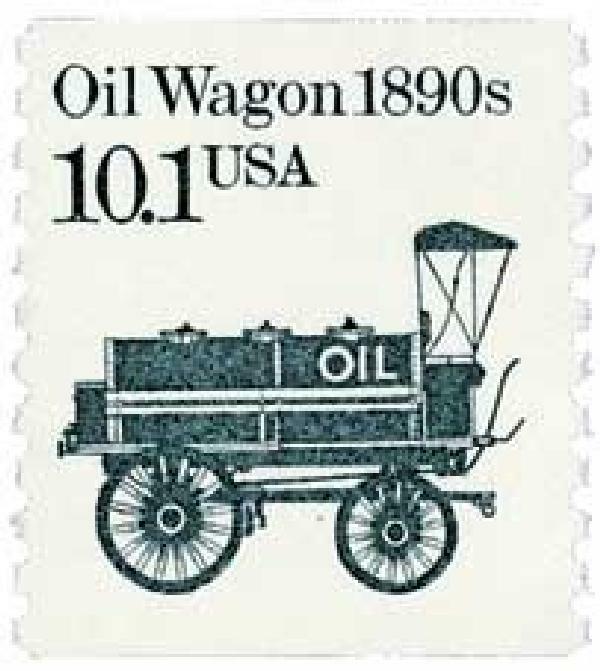 U.S. #2130 – Oil wagons delivered oil to homes. In the mid-1850s, a pair of businessmen bought a farm along the creek and established the Pennsylvania Rock Oil Company. Former railroad conductor Edwin Drake invested all his money – $200 – in the company. Excited by the possibilities, he visited the farm so frequently he was eventually made part of the business and placed in charge of producing petroleum. At the time, oil was usually collected by digging. But Drake believed more oil could be collected if they used a drill similar to that used in salt wells. He enlisted the help of a blacksmith and salt-well driller and designed and built his own oil well drill. The drill moved slowly, about three feet per day. Many of the locals laughed at his slow progress and called it “Drake’s Folly.” But then on August 27, 1859, the drill reached its maximum depth. The next day, Drake found oil near the top of the well, proving his drill to be a success. 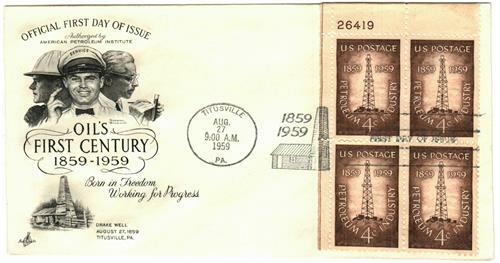 U.S. #1134 FDC – Petroleum Plate Block First Day Cover with cachet by Norman Rockwell. Drake’s well would eventually pump between 12 and 20 barrels of oil a day. However, Drake failed to patent his design and others copied it. 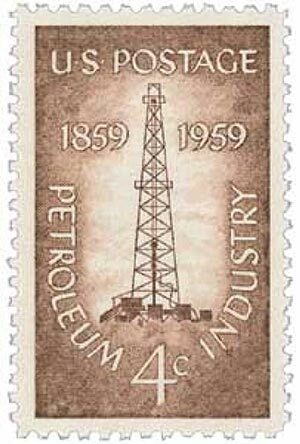 Soon America entered an oil boom and the price fell. The well stopped producing in 1861 and the derrick was displayed at the 1876 Centennial Exposition in Philadelphia. Click here for more on the Drake Well website. 2 Responses to "This Day in History… August 27, 1859"
Visited Drake well several times. My wife having been born in Titusville.